Last week, the White House honored York City for being a "Welcoming Community" for immigrants. The White House honored York City as a "welcoming community" for immigrants. The city was one of more than 50 communities around the country to be highlighted. The White House lauded more than 50 cities and counties for "innovative and proactive efforts" to integrate immigrants into their local communities. The mayor's office said in a news release that it is important for neighborhoods to help new residents to become active members of the community. The city said this is necessary in a practical sense — it'll help the city prosper in the future. Elizabeth Alex, the Maryland-based regional director of CASA in Action, lauded the York City for its efforts. She said the city had done a good job providing services for Spanish-speaking folks, in particular. At this point, she said, the general community is trying to figure out how to bring the Spanish-speaking community into the fold, and the Spanish-speaking community is working on how to do that, too. "We’re thrilled to support both sides of that," she said. CASA: CASA in Action is the lobbying wing of the national Latino-services CASA organization, which has an office in York City Hall. The Obama administration first released a list of communities that signed on to the Building Welcoming Committees last September; it highlighted 40 cities and counties, including Baltimore as well as Philadelphia, Pittsburgh and Allegheny County in Pennsylvania. CASA moved into York City Hall in March, providing English-language and financial-literacy classes, immigration services and voter registration. Alex said much of what they've been doing has been in regards to citizenship. The office has been walking people through the application process to become American citizens, as well as everything that goes along with it, such as voting. In this contentious 2016 election season, voting has become very important for Hispanics, she said. "They're being talked about in the political playing field," she said. "They don't want to be the ball in the middle — they want to be players on the field." Toomey bill: Alex cited one example, a bill introduced in the U.S. Senate by Pennsylvania Sen. Pat Toomey that would cut federal funding to "sanctuary cities." The bill failed Wednesday after it was unable to garner the 60 votes needed to advance past a procedural vote, 53 to 44. 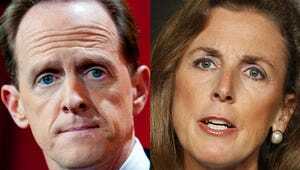 Toomey, a Republican, has tried to make sanctuary cities a wedge issue in his race against Democratic challenger Katie McGinty. Toomey said his bill would have applied to places where the local law-enforcement authorities are instructed not to share information about people's legal status with federal law enforcement. This wouldn't have directly applied to York City or any of the other municipalities in York County, but orders and ordinances in Philadelphia, Pittsburgh and Baltimore all have led to them being considered sanctuary cities. For example, Philadelphia Mayor Jim Kenney signed an order earlier this year that barred police and prison officials from telling U.S. Immigration and Customs Enforcement agents about the pending release from detention of undocumented prisoners unless a prisoner was previously convicted of a violent felony and ICE has a warrant, according to Philly.com. Toomey said in a Wednesday conference call with reporters that this was an issue of public safety — of getting immigrants here illegally, who have been convicted of violent crimes, out of the country. He also said his law would clear up some legal issues that can come up if local law enforcement detains someone at the informal request of federal law enforcement. If federal law enforcement made a mistake and asked that someone be detained who shouldn't be detained, local law enforcement, acting out of "good faith" by taking federal law enforcement's word for it, is open to lawsuits, he said. Toomey's proposed legislation would change this, making it so only federal law enforcement could be sued in such a situation. Toomey's law would have prevented any cities who did keep these laws on the books from having access to federal Community Development Block Grants from the Department of Housing and Urban Development. These grants are a significant chunk of money for many cities — Philadelphia receives $39 million, according to Philly.com; and York City receives $1.8 million. Opposition: The ACLU and Sen. Bob Casey, a Democrat who is the state's other U.S. senator, put out statements last week against the bill. McGinty also opposed Toomey’s bill but called on Kenney to forge an agreement with the Department of Homeland Security. Kenney accused Toomey of fear-mongering. Alex said Toomey's law was a solution in search of an issue; she said it's just more rhetoric, like what presumptive Republican presidential candidate Donald Trump has been saying. "It’s not addressing any of the crises confronting our communities," Alex said. She pointed to the contrast in this bill's goal and the White House's announcement, saying Toomey's effort goes against what many people think. "This sends the opposite message: We're shutting out doors, closing our entry-ways and forcing people out," she said. "He's trying to punish cities and states that are trying to be welcoming communities." "I think Americans are ready to move forward."